"I believe that the people in power -- not only political power, but also economic and social power -- will not non-violently give up that power to the people. Power is not a material possession that can be given, it is the ability to act. Power must be taken, it is never given." Kurdish leaders in Iraq have promised to raise the issue of the northern oil city of Kirkuk which they demand be integrated into a Kurdish autonomous zone after a cabinet is formed. Iran is “trying to help some factions in Iraq work against the Kurdish nation so that Kirkuk doesn’t join the (autonomous zone). This is happening as the new government is being created and the Kirkuk problem is discussed,” Bayik said. Turkey's intent to meddle in Kerkuk was clear in August 2007. In addition, Turkish mercenaries based in Maryland are also operating in Kerkuk. Last week the Hewler-based Kurdistan-TV Satellite Network reported that a well-known Turkish company has been allegedly sending poisoned food in what many have claimed is a calculated attempt to harm Kurdish citizens in the Iraqi or Southern Kurdistan region. Critics of Turkey find little surprise in this recent allegation claiming that after having publicly failed to justify their torture and even executing of anyone who speaks out for human rights in Turkey, the Turkish government has employed new strategic plan to harm innocent civilians of Kurdish descent. Turkey, a country that is often falsely labeled as a democracy, has become familiar to many critics for its countless human rights abuses. The government has been regularly condemned by human rights group for imprisoning anyone who speaks or writes about the Kurdish issue in the country. Recent trade increases between Turkey and the Kurds in Iraq have been viewed as a positive developments in the two group's relations. Turkey is responsible for shipping a very large percentage of foods and other products into South Kurdistan. However, critics say that the Turkish government's policy towards Kurds is unchanged and this recent discovery is proof of that. Turkish companies ship cooking-oil into South Kurdistan and recent discoveries indicate that it comes with poison. The experts who reported these claims say the recurring incident is far from an accident. The President of the Science Department of the University of Salahadin in the Kurdish capital, Hewler, noted that the food from Turkey containing the poison is a perfect mixture to harm and even kill any person who consumes it. Critics speculate that there are many reasons as to why Southern Kurdistan could have possibly been a target; a major one being that Southern Kurdistan has become a representation of Kurdish identity and national pride in the region. Critics say it has been Turkey's aim to wipe it out. Well, if you lie down with dogs, expect to get up with fleas. This is what happens when one relies on an enemy government to provide your food supply and it harkens back to the experiences of many Southern Kurds who fled into Turkey after the 1991 serhildan, only to find that the bread and water supplied by the Ankara regime was poisoned. Don't you wish . . . 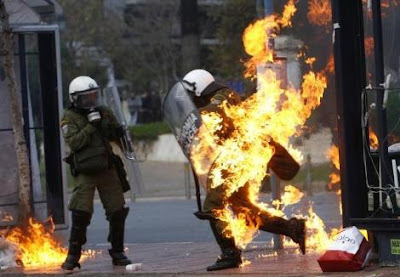 The latent Greek contempt for the police, which has now erupted so volcanically, has its roots in the dictatorship, when the police were regarded as the colonels' enforcers and traitors to the people. In an editorial entitled "Anger's teen martyr", Mr Konstandaras wrote that Mr Grioropoulos' blood would be "used to bind together every disparate protest and complaint into a platform of righteous rage against all the ills of our society. "It will quickly become a flag of convenience for anyone who has a grudge against the state, the government, the economic system, foreign powers, capitalism and so on." "If Greece had already appeared difficult to govern, it will now be out of control." For Athens police, the Exarchia neighborhood is enemy territory. Exactly! I like it already. There's also an update on yesterday's post about the morons at Facebook. Basically, they think "we"--whoever "we"are--are afraid of them. However, they are so fearful of PKK than they can't even mention the term. Instead, they say "those guys". 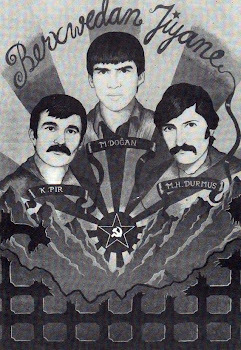 GÖSTERMİŞ OLDUĞUNUZ İLGİ İÇİN HEPİNİZE TEK TEK TEŞEKKÜR EDERİM. FAKAT SESİMİZİ DAHA DA DUYURMAK İÇİN SAĞ TARAFTA BULUNAN PAYLAŞ SEÇENEĞİ İLE GRUBUMUZU PROFİLİNİZDE PAYLAŞA BİLİRSİNİZ. BİZİM ÖYLE DİĞER GRUPLAR GİBİ BİR KORKUMUZ YOK. ARKADAŞINIZI DAVET ETMEZSENİZ, GRUBA KATILMA GİBİ BİR DÜŞÜNCEMİZDE YOK. [ANLATIM BOZUKLUĞU]. ÇÜNKÜ BİZ GÜCÜMÜZÜ BİLİYORUZ. BU GRUPTA HERKES KENDİNİ BİR BİREY OLARAK TEMSİL EDİYOR. SİZE İYİ BİR HABERİM VAR ÇÜNKÜ BAZILARI O KADAR KORKMUŞLAR ki KENDİ WEB SİTELERİNDE BİZİM GRUBUMUZUN REKLAMINI DA YAPMIŞLAR. SÖZDE KENDİLERİNİ SAVUNUP ELİ KANLI OLANLARIN BİZ OLDUĞUNU İMA ETMİŞLER. ONLAR GERÇEKLERDEN KAÇSIN ÖNEMLİ DEĞİL. BİZ ADIM ADIM AMACIMIZA ULAŞACAĞIZ. ONLAR ÖNDERLİK İÇİN WEB SİTELERİNDE ÖZGÜRLÜK YÜRÜĞÜŞÜ DÜZENLESİNLER BİZ NE DE OLSA ONU ENİNDE SONUNDA İPİN UCUNDA SALLANDIRACAĞIZ.GEBERDİKTEN SONRA İSTEDİKLERİ YERE YÜRÜĞÜŞE GÖTÜREBİLİRLER. In the meantime, I guess the CIA will continue to collect their addresses, hometowns, phone numbers, emails, jobs, birthdates, sexual orientations, interests, daily schedules, relations to friends, pictures, political affiliations . . .
Ocalan: Musul ve Kerkük'te misak-ı milliye dâhildi. Konfederalizmle bunları da dâhil ediyorum. Misak-ı Milli önemlidir. Burada Kürtlerin haklarına saygılı olunacağı belirtiliyor. Kürtler ayrılmak istemiyorlardı. Zorla ayırdılar. Benim kastım Kürtlerin haklarıdır. Osmanlı nasıl ki altı yüz yıl boyunca bu bölgede bir güç olarak yönettiyse, eğer böyle bir çözüm geliştirilirse Cumhuriyet de buna öncülük ederek bunu devam ettirebilir." Do you really think everyone here is as stupid as you? If you really refer to what Ocalan mean by misaki-milli then you would quite easy to understand according to his saying that if this applied then there won't be difference between Kerkuk, Suleymani, Amed, Wan or Mahabad. This does not make all of these citiez to join Turkey but Kurdistan which have no borders between the cities or the countries. Simply, during the Ottoman era, all of these Kurdish Cities weren't the part of Turkish Republic but part of the Ottoman Empire. If newly created Turkey really shown effection, care and understanding for the Kurdish people then I am sure today, Kurdistan would have been in the federal states of Turkey as Kurdistan Region or independent state of Kurdistan if the people of Kurdistan really prefered. Please do not believe what others say to you... APOcus or the PKK supporters have probably same size a brain as you do. I believe and accept APO as a leader of the Kurdish people but in the mean time I have my own brain and thinking capabilities. If he says something wrong then I have a brain to judge what he says and considering where he is now and what the enemy do to him I am sure you would understand that a little by given him respect and pasion. I hope that you continue to critize Abdullah Ocalan so that even you can see how stupid that you are! Akivaeldar, you need to read the quote you provide. Ocalan is not "suggesting" what YOU suggest. There is nothing there that even comes close to what YOU suggest. Plus you provide no link to the THEORETICAL ANF article you cite. And I don't care what Ali says in his THEORETICAL analysis. Theoretically and practically speaking, I would SUGGEST you need to learn Turkish and proper citation. I guess I should have explained myself little more clearly. It seems like every Kurd who have nothing to argue about brings Ocalan's sayings on the table and one of these sayings above! Only explanation that the person above who translated what Ocalan said in a way that he reports would be as you suggest not speaking or understanding Turkish or in my view complete ignorance and badness. If, you think about misaki-milli meaning that adding all Kurdistan to Turkey then we would have open war between Turkey-Iran-Iraq-Syria etc, Why the hell Ocalan who advocates piece messages from his Imrali prison would want whole out war in the ME? It makes absolutely no sense for Ocalan to be talking about Misak-i Milli and stoking Turkish racist/ultra-nationalist sentiment. Another rhetorical device can be used to make his peace message. Timing is everything. When the Turkish general staff is talking about invading Kerkuk and declaring it to be its "red line" and telling the world it has a right to invade and asserting that Turkey has jurisdiction over Kerkuk, it makes ZERO sense for Ocalan to talk about Misak-i Milli and how Ocalan recognizes the Misak-i Milli borders. I'm astonished anyone can accept such an argument, no matter how profound the peace message behind it. Can anyone provide Ocalan's thoughts on the Misak-i Milli pact with a source? I also wanted to expand on my thoughts above just in case Aram or someone else assumes I didn't understand Ocalan's message. I do agree with Mizgin and hamo that Ocalan is not suggesting that Turkey "invade" Kerkuk or Mosul but that since the Ottomans were able to establish their rule over and protect the rights of the citizens of the people living within the borders of the Misaki Milli, then the Turkish Republic can also assume that role as a Protector and Guarantor of those rights today. But, rhetorically, it is an extremely provocative argument and a dangerous one! At best it is a pipe dream that Turkey will start to "protect" the rights of the Kurds and at worst it reinforces the idea that the Turkish state should have some say over Kerkuk or Mosul. I don't think anyone should listen to Apo wholeheartedly and with complete seriousness since he's been in isolation for so long and his reportedly being poisoned/intoxicated by Turkish authorities. Of course, it is all still possible that someone in Roj would copy this from the Turkish source as well that is all that can be found on this.